The Spanish Harlem Orchestra returns to Seattle’s Jazz Alley June 21-24. It’s their 15th anniversary tour, and a celebration of the release of their latest CD Anniversary. 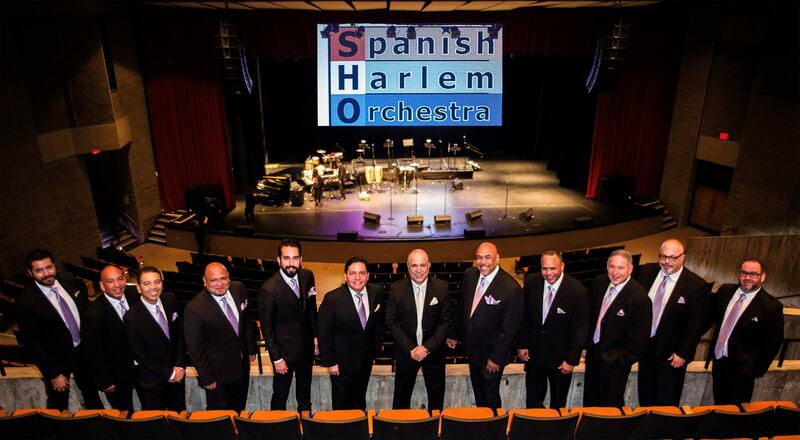 The Spanish Harlem Orchestra was created through “…divine intervention. It wasn’t even my idea,” says Hernández. The recording would eventually be released by Ropeadope Records in 2002. Un Gran Dia En El Barrio was nominated for a Grammy Award. “Boom! That gave me the next 15 years of my life,” says Hernández. The SHO has since racked up more nominations and won two Grammy Awards. Oscar Hernández came up during the flowering of Latino culture in New York City. Music was a huge part of that movement, and it was everywhere. “That was as good as any education you could get at any university. I played with so many great musicans early on. Not to mention all the bandleaders, like Ray Barretto, I did six records with him. That was a school unto itself. That’s a bachelor’s degree right there,” says Hernández. He was also one of the young musicians and arrangers working with Fania Records, home of the Fania All Stars. Hernández was the co-leader and producer of Ruben Blades’ wildly popular band, Seis del Solar. And Oscar’s time as music director for Paul Simon’s musical play The Capeman qualifies as his doctorate degree in musical theatre. That was another facet of his musical life that he’s grateful for. “The whole ride has been pretty amazing,” he says. The Spanish Harlem Orchestra’s repetoire is based on tradition and musical legacy, yet there’s a freshness to their performances and recordings. To that end, the SHO always record live together in the studio. “You hear the interplay in our recordings. That’s what makes it sound fresh and vital, it has that organic raw energy and power that you want to hear,” he explains. Younger players also bring fresh energy to SHO. One of the newest members of the band is flautist and vocalist Jeremy Bosch. “Jeremy is one of the most talented musicians I’ve met in my travels through the years, and it’s really gratifying to see somebody so young who’s got it so together,” says Hernández. “It took me years to be clear on the vision of what the music is, and he’s got a pretty clear vision and he’s really accomplished as a flautist and vocalist.” Jeremy’s talents are well-documented on the new album. Oscar thinks starting the SHO Anniversary West Coast tour at Yoshi’s last month and continuing at Dimitriou’s Jazz Alley next week is auspicious. “Those are two of the best clubs in the United States for listening to music,” he says. SHO will also be in Canada for six dates, including both the Victoria and Vancouver jazz festivals, and they’ll perform at the Monterey Jazz Festival in September. Listen for a selection from the new Spanish Harlem Orchestra album Anniversary this week on Saturday Jazz Caliente. I’ll also feature music from some of the outstanding musicians who have been in the SHO for a number of years, like trombonist Doug Beavers, vocalist Carlos Cascante, and saxophonist/flautist Mitch Frohman.